Suwa Grand Shrine Shimosya Akimiya (諏訪大社下社秋宮) is one of four Suwa Grand Shrine located north side of Lake Suwa. It is one of the most important shrines in Japan and many people worship Suwa Grand Shrine. The main shrine was built in 1781 by Tatekawa Tomimune, and Kaguraden was built in 1835 by Tatekawa Tomiaki, the 2nd. They are registered as the historical assets of Japan. Shimo Suwa is also popular for Onsen. Shimosya also has Onsen in the shrine. There is Onsen for ritual hand washing. Enshrines: Takeminakata no Kami, Yasakatome no Kami, and Yaekotoshironushi no Kami. Suwa Shrines are one of the biggest shinto society which has about 25,000 shrines and 100 to 500 thousands believers. Legend said in Japanese myth, when Takemikazuchi no Mikoto, enshrined at Kashima Shrine, defeated Okuninushi and conquered Izumo, Takeminakata no Mikoto, the son of Okuninushi, never accepted to give their land to Amaterasu Omikami. He challenged Takemikazuchi no Mikoto by Sumo match, but he lost. He have to escape from Izumo and arrived to Suwa. Then, he build new country at Suwa. This is the origin of Suwa Grand Shrine. However, most likely it Suwa Shrine called "Osuwa-sama" or "Suwa Daimyojin, " and never called its individual name. Also, many of the ritual ceremonies and festivals are based on the local religions. Like other typical shrines, it takes sacred tree, Goshinboku. ... is 800 years' old Cedar Tree. ... was built in 1835 by Tatekawa Tomiaki the second. He designed and built this architecture in front of his father's work. He made this Kaguraden as gorgeous as the main shrine to match up and create the great harmony. ... was built in 1781 by Tatekawa Tomimune. He studied Tatekawa style architecture, and learned carving from Nakazawa Gohei. Because he was great architect and carving designer, he made great carving at the gate of this shrine. It is Sayu-Katahaiden Style. 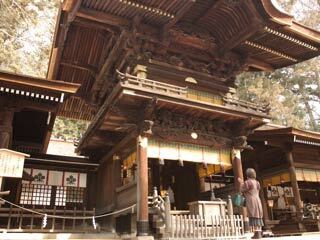 Both sides of the Haiden, the pray-shrine, are used for ritual worshiping with the priest. ... is the largest bronze Komainu Statue which is 1.7m tall.